A rhythm game that offers an alternative to button bashing typical in this genre, instead offering a unique mechanic in this musical, fantasy-themed, rhythmic extravaganza! The rhythmic mechanism in this game is far different compared to any other rhythmic game. The graphics are very beautiful. It has jaw-dropping quality! 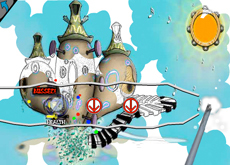 If you are one for music and flash games, you have got to play this.